With the help of our partner charity DCM, Arthur has his own home, a new set of teeth, is on a path to employment, and is able to hear so much better. DCM is dedicated to supporting people like Arthur, people who are experiencing homelessness, into sustainable housing. Here’s his story. To be human is to be on a journey – in Samoan, faigamalaga. A journey to discover your own kaupapa, and to find ways to live it out. At DCM, we talk about picking up the paddle – ki te hoe. For me, that’s a journey to becoming and to being my best self. We call the people we work with taumai, meaning ‘to settle’. You could say that to be human is to be on a journey to a place where you are settled, where your wairua (in Samoan, agaga) is settled. Tihema brings her dentist skills to those who need it most as a volunteer down at DCM's Dental Service. She shares some of the recent stories from the dental chair with us, and how for some, addressing that debilitating pain is the first step that's needed on the journey to getting healthy and housed. We asked Wellington mayor (and One Percent Collective supporter) Justin Lester and DCM director Stephanie McIntyre about common misconceptions around homelessness, what’s needed to end it, and how the average Joe can help. Te Aro Healthcare Centre have generously partnered with DCM Wellington, providing a walk-in nursing service to a very high needs population. Piano. Accordion. Ukulele. These are just a few of the instruments that Alan Norman plays. You see, Alan speaks music. It’s the language in which he expresses himself. Sometimes it’s the language he uses where he works. Alan works at Downtown Community Ministry (DCM) – a charity organisation that deals with homeless Wellingtonians, providing much needed support to over 850 service users. Alan spends his time connecting with service users on a daily basis, building a rapport of trust and friendship, often with the help of a guitar or two. He also has established DCM’s first Ukulele Orchestra – Ukes Matawaka. This orchestra meets weekly to rehearse and perform around town. We talk to Alan about how music transcends great divides. “I was brought up in Titahi Bay. It was a great place to grow up and develop an affinity with the sea, which still has a big influence on my life. I began playing and learning music at a very young age and I found I had a pretty keen ear. Amongst my more formal training I found I could play something just by listening to it. I’ve been fortunate to have played with some of the best in the business and I’ve played on countless recordings for different artists. Being with the Warratahs I learnt a bunch of country licks. You’ll still find me out there playing ‘live’ around Wellington with different combinations of people and instruments. I trained as a psychopaedic nurse in 70s, and found that music was an incredible therapeutic tool. Now I often have guitars in my office. At DCM playing and singing Waiata is a good way of initially getting to know someone. Two minutes of ‘jamming’ can be as beneficial as 2 hours of talking. It’s also a good conversation piece if dealing with a music enthusiast of which there are many here! A musical exchange between two people can ease any tension and can lead to easy conversation. It can break down barriers. The Ukes Matawaka was a collective idea and came about after enthusiasm for a singing group started to wane. It is necessary because it gives people in our service a chance to express themselves creatively. One person that joined us is Bronwyn. Bronwyn is a remarkable singer who has gained confidence in her singing by participating in the Ukes Matawaka. She has a unique colour in her vocal tone that gives the orchestra character. DCM provides essential services to Wellington's vulnerable, such as health care, access to housing, financial advice and food parcels. If you would like to leanr more about the work that they do, and to give your 1% to them through One Percent Collective, check them out below. What’s in every home, used everyday, and has the potential to raise some serious funds for a super awesome Wellington charity? Bowls. Yes that’s right, bowls. 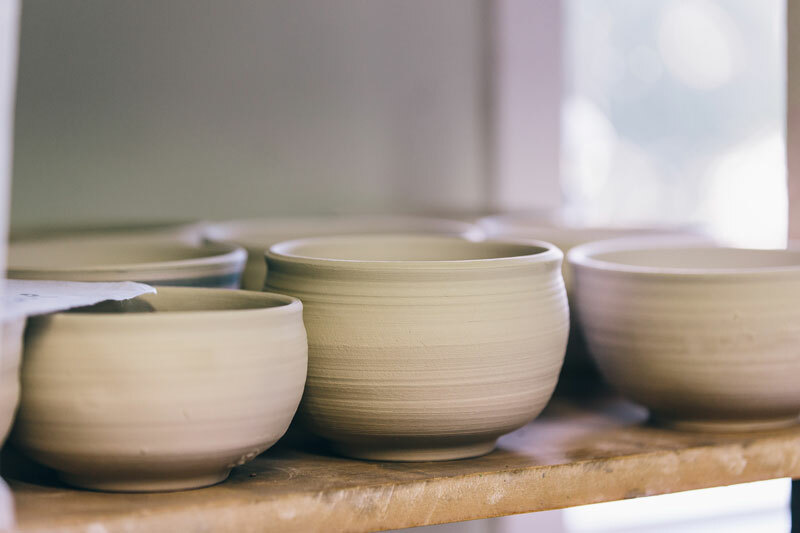 Soup bowls, pudding bowls, maybe even bowls for haircuts – The Wellington Potters Association have put clay to kiln in order to raise some funds for our partner charity DCM with their project Empty Bowls 2015. A target of 850 handcrafted bowls was set by the Wellington potters to symbolise the number of people going through DCM each year. These bowls are to be sold at local cafés and at the popular supermarket Moore Wilson's. "For $20 people will get a beautiful bowl. It's a token to always remind them they are lucky to be able to buy a nice warm bowl of soup,” says organiser Rebecca Flowerday. Masterchef Rex Morgan from Boulcott St Bistro will launch the bowls at Moore Wilson's on Saturday the 1st of August at 11am, along with a bowl of soup for the punters. Keep your eyes peeled for this wonderful example of creative philanthropy in a café near you. Here is a list of the lucky suppliers. You should totally buy a bowl. They are bound to make your food taste better.